Age. Although lupus affects people of all ages, it's most often diagnosed between the ages of 15 and 40. Bone tissue death (avascular necrosis). This occurs when the blood supply to a bone diminishes, often leading to tiny breaks in the bone and eventually to the bone's collapse. The hip joint is most commonly affected. Erythrocyte sedimentation rate. This blood test determines the rate at which red blood cells settle to the bottom of a tube in an hour. A faster than normal rate may indicate a systemic disease, such as lupus. The sedimentation rate isn't specific for any one disease. It may be elevated if you have lupus, another inflammatory condition, cancer or an infection. Get adequate rest. People with lupus often experience persistent fatigue that's different from normal tiredness and that isn't necessarily relieved by rest. For that reason, it can be hard to judge when you need to slow down. Get plenty of sleep at night and naps or breaks during the day as needed. 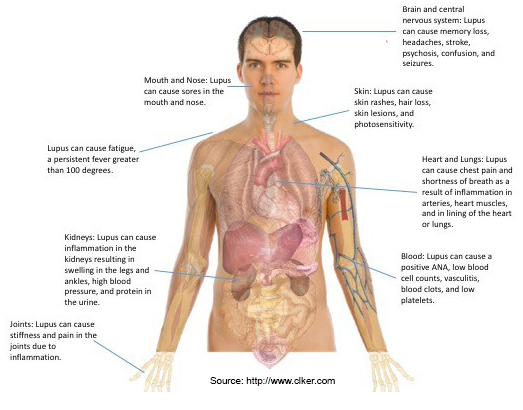 Learn all you can about lupus. Write down all the questions you have about lupus and ask them at your next appointment. Ask your doctor or nurse for reputable sources of further information. The more you know about lupus, the more confident you'll feel in your treatment choices. Gather support among your friends and family. Talk about lupus with your friends and family and explain ways they can help out when you're having flares. Lupus can be frustrating for your loved ones because they usually can't see it, and you may not appear sick. They can't tell if you're having a good day or a bad day unless you tell them. Be open about what you're feeling so that your friends and family know what to expect.